Infographic: How to define the IT service structure? - ITIL implementation, step 2. Any ITIL initiative should start by looking at services. After all, the whole idea behind introducing ITIL is to achieve a better focus on services. To get a clear picture of the service provider's range of services, it is advisable to develop a service structure, comprising both customer services and supporting services. This reflects one of the most important principles in ITIL and other service management frameworks: Customer services (services offered to customers) are typically based on a set of supporting services (services visible only inside the service provider organization). Supporting services may be operated with the service provider's own resources or by an external party. Customer services are characterized by providing value to clients, an example would be a service which allows the clients to send and receive emails and to access the internet. Supporting services, in contrast, are not of direct value to clients but are needed as building blocks for customer services. The provision of a suitable network infrastructure, for example, would be a typical supporting service which is required to offer clients an internet access service. In other words, what the customers want is reliable internet access, not a specific sort of network infrastructure (in fact it is irrelevant to the clients that some infrastructure is needed to provide them with internet access). A good way to get started is creating a list of existing customer services, using - if possible - existing agreements and other documentation. If no service-related information is available, a basic list must be drawn from scratch, including at least short service descriptions and an overview of which customers use which services. One it is clear which business services are provided for the customers it becomes possible to identify the required supporting services. A key objective of defining supporting services is to assign responsibilities for the delivery of those services: The service owners are responsible for delivering the services in accordance with the agreed service quality levels. Supporting services are often closely related to certain parts of the technical infrastructure, such as major application systems or infrastructure components: "Providing the SAP environment" would be a typical example. Having identified customer and supporting services, the remaining task is to draw up the service structure by determining their interdependencies (see Fig. 1: IT service structure - example). Supporting services may be arranged in several layers; for example, a service responsible for operating a certain application system may rely on another supporting service providing a basic operation system environment. The service structure drawn up in this project step will be a valuable input at a later point in time, when the Service Catalogue Management process is being implemented. 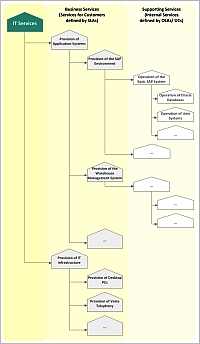 Service structure, describing the service interdependencies. It is not recommended at this stage to ask customers to sign Service Level Agreements: SLAs should be signed at a later point in time, when the services have been formally set up. The IT service structure should be created in close coordination with the IT organization's clients.